This book is so full of Win I don’t know where to start. Post-apocalyptic feminist fiction. Sign me up. 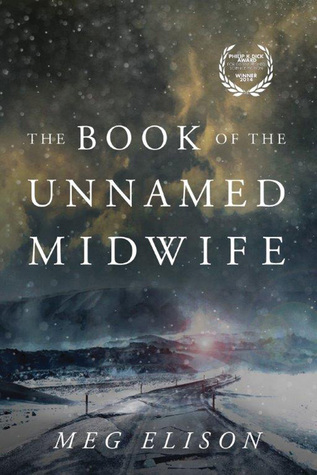 This novel takes place in a not-too distant future, with an unnamed female nurse-midwife waking up in a deserted hospital after a plague has ravaged most of the world’s population. The plague takes on the form of a fever, striking everyone but mostly women in childbirth, who give birth to dead babies and in turn die as well. Because of the extreme scarcity of women, the world has become a dangerous place for them. There are no rules or civility, and women in the world after the plague are regularly raped, mutilated, and enslaved by lawless bands of men, traded for goods and services, treated as property. It’s harsh stuff to read, but the Unnamed Midwife avoids this fate by dressing as a man and battling for survival. She helps all of the women she meets by rescuing them from their slavers, offering them birth control, and assisting with births. The story follows her as she journeys from San Francisco to the North and beyond, through hell on earth and finally, to something like hope. This book takes post-apocalyptic fiction and completely turns it into something that I haven’t seen done before. I usually hate it when these kinds of stories don’t explain things (i.e., the cause of the plague, etc) but here I didn’t mind the not knowing, because it’s the story itself that’s so much more important. The midwife is very open about her own sexuality and although (I think) she identifies as bisexual, her constant changing of gender roles through her practice of dressing as a man turns this notion on its head. Either way, I loved it. This book is a series, and there is a second book available (“The Book of Etta”) that came out earlier this year. I ran to my library and got it a couple of hours after I finished with this. There is also a third book (“The Book of Flora”) that is set to be published early next year, which I plan to read as well. Meg Elison is an incredible writer and this is an equally incredible book. Do read this. You won’t regret it!